This section is a “How-To” that describes the basics for how to plan, install, configure, and run a MySQL Cluster. Whereas the examples in Section 15.4, “MySQL Cluster Configuration” provide more in-depth information on a variety of clustering options and configuration, the result of following the guidelines and procedures outlined here should be a usable MySQL Cluster which meets the minimum requirements for availability and safeguarding of data. This section covers hardware and software requirements; networking issues; installation of MySQL Cluster; configuration issues; starting, stopping, and restarting the cluster; loading of a sample database; and performing queries. Note: In the interest of simplicity (and reliability), this How-To uses only numeric IP addresses. However, if DNS resolution is available on your network, it is possible to use hostnames in lieu of IP addresses in configuring Cluster. Alternatively, you can use the /etc/hosts file or your operating system's equivalent for providing a means to do host lookup if such is available. Each host in our scenario is an Intel-based desktop PC running a common, generic Linux distribution installed to disk in a standard configuration, and running no unnecessary services. The core OS with standard TCP/IP networking capabilities should be sufficient. Also for the sake of simplicity, we also assume that the filesystems on all hosts are set up identically. In the event that they are not, you will need to adapt these instructions accordingly. Standard 100 Mbps or 1 gigabit Ethernet cards are installed on each machine, along with the proper drivers for the cards, and that all four hosts are connected via a standard-issue Ethernet networking appliance such as a switch. (All machines should use network cards with the same throughout. That is, all four machines in the cluster should have 100 Mbps cards or all four machines should have 1 Gbps cards.) MySQL Cluster will work in a 100 Mbps network; however, gigabit Ethernet will provide better performance. Note that MySQL Cluster is not intended for use in a network for which throughput is less than 100 Mbps. For this reason (among others), attempting to run a MySQL Cluster over a public network such as the Internet is not likely to be successful, and is not recommended. For our sample data, we will use the world database which is available for download from the MySQL AB Web site. As this database takes up a relatively small amount of space, we assume that each machine has 256MB RAM, which should be sufficient for running the operating system, host NDB process, and (for the data nodes) for storing the database. Although we refer to a Linux operating system in this How-To, the instructions and procedures that we provide here should be easily adaptable to either Solaris or Mac OS X. We also assume that you already know how to perform a minimal installation and configuration of the operating system with networking capability, or that you are able to obtain assistance in this elsewhere if needed. One of the strengths of MySQL Cluster is that it can be run on commodity hardware and has no unusual requirements in this regard, other than for large amounts of RAM, due to the fact that all live data storage is done in memory. (Note that this is subject to change, and that we intend to implement disk-based storage in a future MySQL Cluster release.) Naturally, multiple and faster CPUs will enhance performance. Memory requirements for Cluster processes are relatively small. The software requirements for Cluster are also modest. Host operating systems do not require any unusual modules, services, applications, or configuration to support MySQL Cluster. For Mac OS X or Solaris, the standard installation is sufficient. For Linux, a standard, “out of the box” installation should be all that is necessary. The MySQL software requirements are simple: all that is needed is a production release of MySQL-max 5.0; you must use the -max version of MySQL to have Cluster support. (See Section 5.3, “The mysqld-max Extended MySQL Server”.) It is not necessary to compile MySQL yourself merely to be able to use Cluster. In this How-To, we assume that you are using the -max binary appropriate to your Linux, Solaris, or Mac OS X operating system, available via the MySQL software downloads page at http://dev.mysql.com/downloads/. Security: Communications between Cluster nodes are not encrypted or shielded in any way. The only means of protecting transmissions within a MySQL Cluster is to run your Cluster on a protected network. If you intend to use MySQL Cluster for Web applications, the cluster should definitely reside behind your firewall and not in your network's De-Militarized Zone (DMZ) or elsewhere. Efficiency: Setting up a MySQL Cluster on a private or protected network allows the cluster to make exclusive use of bandwidth between cluster hosts. Using a separate switch for your MySQL Cluster not only helps protect against unauthorized access to Cluster data, it also ensures that Cluster nodes are shielded from interference caused by transmissions between other computers on the network. For enhanced reliability, you can use dual switches and dual cards to remove the network as a single point of failure; many device drivers support failover for such communication links. It is also possible to use the high-speed Scalable Coherent Interface (SCI) with MySQL Cluster, but this is not a requirement. See Section 15.9, “Using High-Speed Interconnects with MySQL Cluster”, for more about this protocol and its use with MySQL Cluster. Each MySQL Cluster host computer running data or SQL nodes must have installed on it a MySQL-max binary. For management nodes, it is not necessary to install the MySQL server binary, but you do have to install the MGM server daemon and client binaries (ndb_mgmd and ndb_mgm, respectively). This section covers the steps necessary to install the correct binaries for each type of Cluster node. RPMs are also available for both 32-bit and 64-bit Linux platforms; as of MySQL 4.1.10a, the -max binaries installed by the RPMs support the NDBCluster storage engine. If you choose to use these rather than the binary files, be aware that you must install both the -server and -max packages on all machines that are to host cluster nodes. (See Section 2.4, “Installing MySQL on Linux”, for more information about installing MySQL using the RPMs.) After installing from RPM, you will still need to configure the cluster as discussed in Section 15.3.3, “Multi-Computer Configuration”. Note: After completing the installation, do not yet start any of the binaries. We will show you how to do so following the configuration of all nodes. The syntax for useradd and groupadd may differ slightly on different versions of Unix, or they may have different names such as adduser and addgroup. Change location to the directory containing the downloaded file, unpack the archive, and create a symlink to the mysql-max directory named mysql. Note that the actual file and directory names will vary according to the MySQL version number. shell> chown -R root . shell> chgrp -R mysql . Here we use Red Hat's chkconfig for creating links to the startup scripts; use whatever means is appropriate for this purpose on your operating system and distribution, such as update-rc.d on Debian. Remember that the preceding steps must be performed separately for each machine on which a storage or SQL node is to reside. Installation for the management (MGM) node does not require installation of the mysqld binary. Only the binaries for the MGM server and client are required, which can be found in the downloaded archive. Again, we assume that you have placed this file in /var/tmp. In Section 15.3.3, “Multi-Computer Configuration”, we will create and write configuration files for all of the nodes in our example Cluster. For our four-node, four-host MySQL Cluster, we will need to write four configuration files, one per node/host. Each data node or SQL node requires a my.cnf file that provides two pieces of information: a connectstring telling the node where to find the MGM node, and a line telling the MySQL server on this host (the machine hosting the data node) to run in NDB mode. For more information on connectstrings, see Section 15.4.4.2, “The MySQL Cluster connectstring”. The management node needs a config.ini file telling it how many replicas to maintain, how much memory to allocate for data and indexes on each data node, where to find the data nodes, where to save data to disk on each data node, and where to find any SQL nodes. We show vi being used here to create the file, but any text editor should work just as well. After entering the preceding information, save this file and exit the text editor. Do this for the machines hosting data node “A”, data node “B”, and the SQL node. Important: Once you have started a mysqld process with the ndbcluster and ndb-connectstring parameters in the [MYSQLD] in the my.cnf file as shown previously, you cannot execute any CREATE TABLE or ALTER TABLE statements without having actually started the cluster. Otherwise, these statements will fail with an error. This is by design. # this example Cluster setup. After all the configuration files have been created and these minimal options have been specified, you are ready to proceed with starting the cluster and verifying that all processes are running. We discuss how this is done in Section 15.3.4, “Initial Startup”. For more detailed information about the available MySQL Cluster configuration parameters and their uses, see Section 15.4.4, “Configuration File”, and Section 15.4, “MySQL Cluster Configuration”. For configuration of MySQL Cluster as relates to making backups, see Section 15.8.4, “Configuration for Cluster Backup”. Note: The default port for Cluster management nodes is 1186; the default port for data nodes is 2202. Beginning with MySQL 5.0.3, this restriction is lifted, and the cluster automatically allocates ports for data nodes from those that are already free. Note that it is very important to use the --initial parameter only when starting ndbd for the first time, or when restarting after a backup/restore operation or a configuration change. This is because the --initial option causes the node to delete any files created by earlier ndbd instances that are needed for recovery, including the recovery log files. If you used RPM files to install MySQL on the cluster host where the SQL node is to reside, you can (and should) use the startup script installed in /etc/init.d to start the MySQL server process on the SQL node. Note that you need to install the -max server RPM in addition to the Standard server RPM to run the -max server binary. Note: If you are using an older version of MySQL, you may see the SQL node referenced as [mysqld(API)]. This reflects an older usage that is now deprecated. You should now be ready to work with databases, tables, and data in MySQL Cluster. See Section 15.3.5, “Loading Sample Data and Performing Queries”, for a brief discussion. This must be done for the definition of each table that is to be part of the clustered database. The easiest way to accomplish this is to do a search-and-replace on the file that contains the definitions and replace all instances of TYPE=engine_name or ENGINE=engine_name with ENGINE=NDBCLUSTER. If you do not want to modify the file, you can use the unmodified file to create the tables, and then use ALTER TABLE to change their storage engine. The particulars are given later in this section. It is very important to keep in mind that the preceding command must be executed on the host where the SQL node is running (in this case, on the machine with the IP address 192.168.0.20). If you save the file to a different location, adjust the preceding instructions accordingly. It is important to note that NDB Cluster in MySQL 5.0 does not support autodiscovery of databases. (See Section 15.10, “Known Limitations of MySQL Cluster”.) This means that, once the world database and its tables have been created on one data node, you need to issue the CREATE SCHEMA world statement (beginning with MySQL 5.0.2, you may use CREATE SCHEMA world instead), followed by FLUSH TABLES on each SQL node in the cluster. This causes the node to recognize the database and read its table definitions. We simply use the MySQL server's root account and assume that you have followed the standard security precautions for installing a MySQL server, including setting a strong root password. For more information, see Section 2.10.3, “Securing the Initial MySQL Accounts”. It is worth taking into account that Cluster nodes do not make use of the MySQL privilege system when accessing one another. Setting or changing MySQL user accounts (including the root account) effects only applications that access the SQL node, not interaction between nodes. We assume that the process running on the Web server can reach the IP address of the SQL node. In a similar fashion, you can use the MySQL C API, Perl-DBI, Python-mysql, or MySQL AB's own Connectors to perform the tasks of data definition and manipulation just as you would normally with MySQL. The -e option here is used to pass a command to the ndb_mgm client from the shell. See Section 4.3.1, “Using Options on the Command Line”. The command causes the ndb_mgm, ndb_mgmd, and any ndbd processes to terminate gracefully. 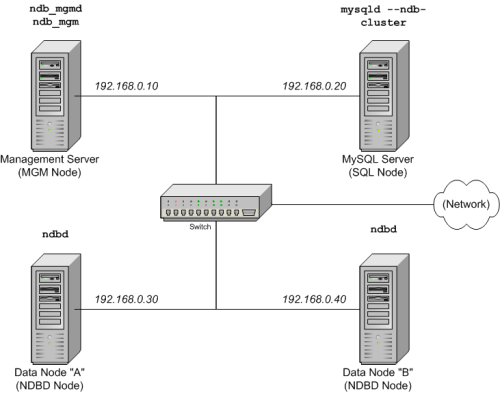 Any SQL nodes can be terminated using mysqladmin shutdown and other means. Remember not to invoke this command with the --initial option when restarting an NDBD node normally. For information on making Cluster backups, see Section 15.8.2, “Using The Management Client to Create a Backup”. To restore the cluster from backup requires the use of the ndb_restore command. This is covered in Section 15.8.3, “How to Restore a Cluster Backup”. More information on configuring MySQL Cluster can be found in Section 15.4, “MySQL Cluster Configuration”.